Heat oven to 400°F. Spray 13x9-inch (3-quart) glass baking dish with cooking spray. In 12-inch nonstick skillet, cook beef and onion over medium-high heat 8 to 10 minutes, stirring frequently, until beef is brown; drain. Stir in salt and pepper. Spread in dish. Sprinkle with 2 cups of the cheese. In medium bowl, stir Bisquick™ mix, milk and eggs with whisk until blended. Pour into baking dish. Arrange frozen potatoes on top of casserole. Bake 40 to 45 minutes or until potatoes are browned. Sprinkle evenly with remaining 1 cup cheese; bake 3 to 5 minutes or until cheese is melted and knife inserted in center comes out clean (165°F in center). Let stand 10 minutes before serving. To make ahead: Cook beef mixture; spread in baking dish. Refrigerate uncovered 30 minutes. Sprinkle with 2 cups of the cheese; pour Bisquick™ mixture over top. Cover and refrigerate overnight. To bake: Heat oven to 400°F. 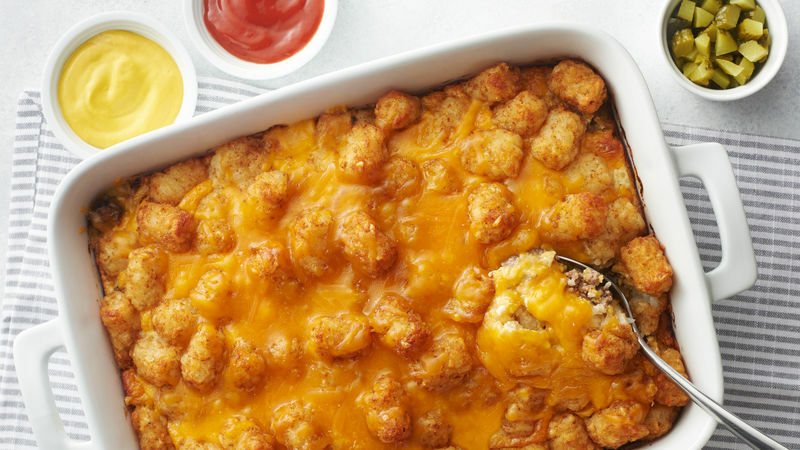 Uncover casserole; arrange frozen potatoes on top. Bake and top with cheese as directed. For the full cheeseburger experience, serve this dish with ketchup, mustard and pickles on the side. Store leftovers in refrigerator up to 3 days—just reheat and enjoy!